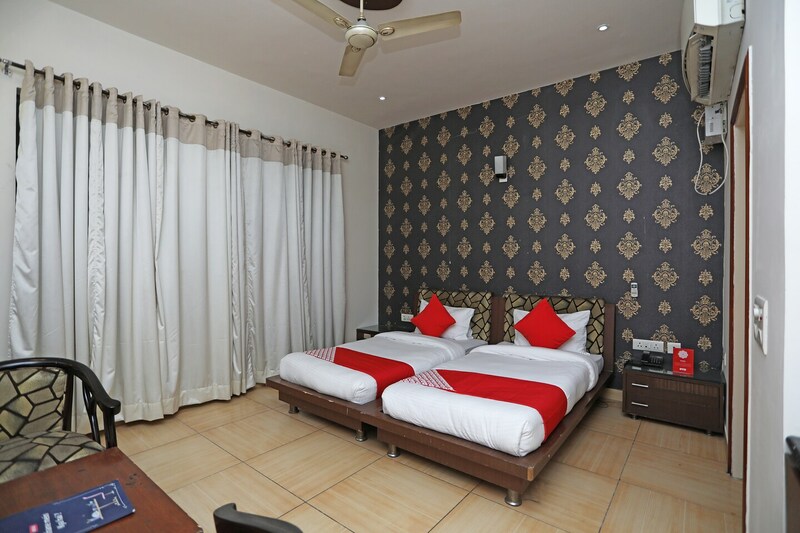 Elegant Rooms With Ample Of Amenities at a Budget Price. The pocket-friendly yet classy hotel is situated in Sector 39 near Unitech Cyber Park in Gurgaon. The nearest metro station is Shalimar Huda City Centre, 8 minutes away. Nearest attractions include Kingdom of Dreams, HUDA Public Park, Leisure Valley Park, Iskcon Gurgaon and more. The rooms are elegantly adorned with painted walls and complementing furniture. The en-suite bathrooms are neatly managed and luxuriously styled. Wi-Fi, TV, AC and king-sized bed are available in all rooms. Parking facility, laundry services, kitchen, CCTV surveillance, card payment and power backup are other services offered. Royal Spice, Dunkin Donuts, KB2, The Chocolate Room, Tea Halt and many more restaurants are located nearby. Closest malls are Omaxe Celebration, Raheja and Sahara Mall.